This edition of our Best of Michigan Football series zeroes in on the best safeties to play for the Wolverines. The list starts at No. 10 and works to No. 1. #10 – Keith Bostic: Bostic was a ball-hawking safety at Michigan. He is tied for 10th place in Michigan history with 10 career interceptions. During the 1982 season, Bostic recovered four fumbles which is good for second place on Michigan’s single season list. That same season, Bostic racked up 119 interception return yards which is tied for the sixth best single season total in school history. His six career fumble recoveries is tied for second on Michigan’s all-time list. Bostic was a first-team All-Big Ten selection in 1982. He finished his career with 210 total tackles. #9 – Gene Derricotte: Derricotte impacted the game in all three phases as a running back, safety and punt returner during his Michigan career. He ranks fourth in school history with 12 career interceptions. During the 1946 season, Derricotte recorded six interceptions, only four Michigan players have ever topped that mark during a season. He was one of the most prolific punt returners in school history as well. #8 – Ernest Shazor: A two-year starter at safety, Shazor recorded 166 tackles, 19 tackles for loss and four interceptions in his career. He returned one of those interceptions 88 yards for a touchdown, which is the fourth longest interception return in school history. In 2004, Shazor led Michigan with 84 tackles. He also notched 10 tackles for loss, two interceptions and two fumble recoveries. He was named a first-team All-American and was a finalist for the Jim Thorpe Award that season. #7 – Jordan Kovacs: He began his Michigan career as a walk-on and ended it as a team captain and team MVP. Kovacs notched 193 solo tackles in his career which is good for 10th place on Michigan’s all-time list. He ranks sixth with 334 total tackles in his career. No Michigan Wolverines defensive back has ever recorded more tackles than Kovacs. Kovacs notched five interceptions, forced six fumbles, 26 tackles for loss and seven sacks in his career. He earned All-Big Ten honors three times during his career and was a finalist for the Burlsworth Trophy in 2012. #6 – Vada Murray: Murray was a three-year starter at free safety (1988-90) and played on three Big Ten championship teams. He is tied for sixth place in Michigan Football history with 11 career interceptions. Murray also tallied 142 tackles and 15 pass break ups in his career. He was famous for his kick blocking abilities. 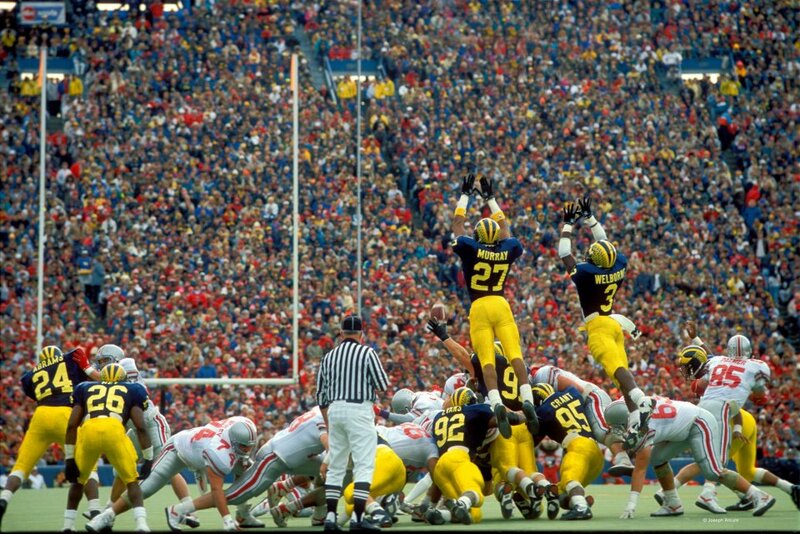 There is an iconic photo of Murray and Tripp Welbourne soaring through the Big House skies against Ohio State, while going for a block, that captures the majesty of Murray’s athletic ability. Murray served as a police officer in Ann Arbor for 21 years. He passed away in 2011 after a battle with cancer. You can support the Vada Murray Fund for Cancer Research. Murray was a second-team All-Big Ten selection in 1989. #5 – Don Dufek Jr: Twice an All-Big Ten strong safety, Dufek completed his career (1973-75) with 249 tackles, nine fumble recoveries and four interceptions. He was a team captain in 1975. Dufek was a two-time All-Big Ten selection and earned All-American honors in 1975. Dufek’s 249 career tackles was a school record for a defensive back, at that time. He also played hockey at Michigan, earning four varsity letters on the ice. #4 – Rick Volk: A tremendous athlete, Volk went from playing quarterback and running back to becoming an All-American defensive back at Michigan. He was an outstanding tackler and a fierce hitter. Volk is considered one of the best defensive players of his era. Volk was a first-team All-Big Ten selection in 1965 and 1966. He was a first-team All-American in 1966. Volk was selected in the second round of the 1967 NFL Draft by the Baltimore Colts. He played in the league for 12 years. Volk played in three Pro Bowls and two Super Bowls. He is the nephew of Michigan great Bob Chappius. #3 – Thom Darden: Darden played all the defensive back positions during his career. He was a 1971 All-American selection at safety. Darden’s 92-yard interception return for a touchdown against UCLA in 1971 is tied for the longest return in school history. He returned another interception 60 yards for a touchdown against Indiana in 1971. He is the only player in school history to return two interceptions for touchdowns in the same season. Darden also returned a fumble for a touchdown, giving him three defensive touchdowns in his career. ESPN chose Darden’s November 21, 1971 interception against Ohio State as one of the 100 plays, performances and moments that define college football. The play was a very controversial call late in a 10–7 game when Darden intercepted a pass. Ohio State coach Woody Hayes stormed the field to rant at referee Jerry Markbreit about the play as he thought it should have been ruled pass interference. By the end of Hayes’ tirade, he had broken a yard marker, shredded a first-down indicator and earned two 15-yard unsportsmanlike conduct penalties. The scene was replayed over and over on national television broadcasts. That was Darden’s second interception in the game. ESPN also chose Darden as a member of the All-Time University of Michigan Football team. Darden finished his illustrious career with 218 tackles, 11 tackles for loss, and 13 pass break ups. He is tied sixth in Michigan Football history with 11 career interceptions. He was selected in the first round of the 1972 NFL Draft by the Cleveland Browns. He is the Browns career interceptions leader. #2 – Tom Curtis: Curtis set a school and then NCAA record with 25 interceptions during his career. He is still Michigan’s career interceptions leader and ranks second in Big Ten history and is tied for fourth in NCAA history in carer interceptions. Curtis racked up all of those interceptions despite playing only three seasons (freshmen were ineligible when he played). Curtis was a senior on Bo Schembechler’s first team at Michigan. He notched eight interceptions and 55 tackles that season (1969). He was named an All-American and played a key role in the Wolverines upset victory over Ohio State. Curtis was also a two-time All-Big Ten selection. Curtis played two seasons for the Baltimore Colts, including their Super Bowl V winning team. He was inducted into the College Football Hall of Fame in 2005. #1 – Tripp Welborne: Sullivan Anthony Welborne III came to Michigan as a wide receiver and moved to defensive back after his freshmen season. The move proved to be a brilliant decision as Welborne would become a two-time consensus All-American Safety (1989-90). He tallied 238 tackles, 11 tackles for loss and nine interceptions in his career. He ended his career just 11 tackles shy of Don Dufek’s then school record for a defensive back. Welborne was a member of three Big Ten Championship teams at Michigan. Welborne was also an outstanding punt returner. He set the single season punt return yardage record in 1990 with 455 and that record stood until Steve Breaston broke it in 2003. In Michigan’s 1990 thrashing of Indiana Welborne totaled 117 punt return yards (third best single game total in school history). He also recorded two tackles and a pass break up in the game. Unfortunately Welborne suffered a terrible knee injury in his senior season, that derailed his football career.